And the first finished object of the new blog. My very cool Pink Elephants! socks, using the very lovely (and free) Water for the Elephants pattern (available via Ravelry), and the very squishy and vibrant Yarn Yard Clan in two contrasting shades. I got this yarn on sale as part of a Lucky Dip bag, £20 for five mystery skeins. These two, a rather warm dark gray and eye-searing pink, just needed to go together. And as it happened, I had favourited this particular pattern just the day before. I had to modify the toes (so that they are pink rather than gray – I would have run out of gray yarn otherwise), and just knitted a plain stockinette heel, but the rest of them are knitted as the pattern specified. And they are very, very cosy. 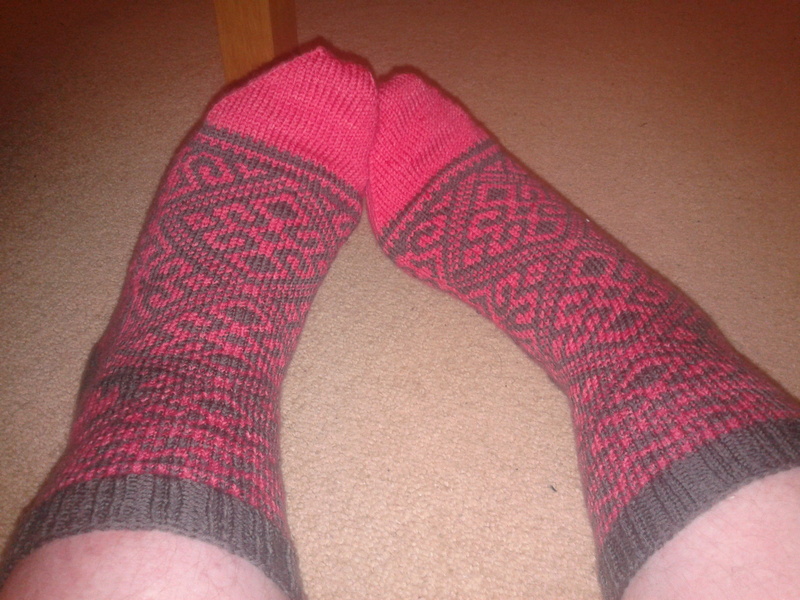 Tags: fo, NaBloPoMo, Socks | Permalink.